Determine the size instrument you'll need - if you need assistance, bring your young'un to see us! 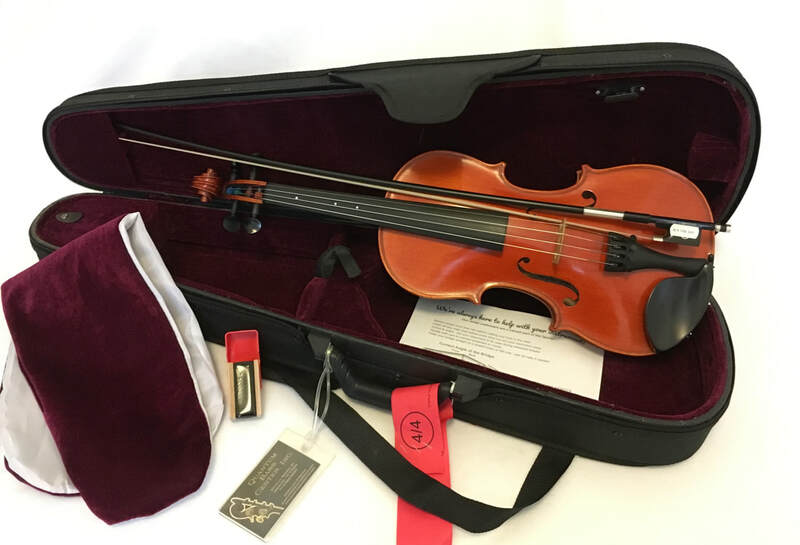 Our knowledgeable staff can outfit you with the correct size violin, viola, cello or bass. Read the rental contract (.pdf file below), so you know what you'll be signing. Please feel free to contact us with any questions! - SUPERIOR INSTRUMENTS: Don't struggle to learn on a substandard instrument and/or fiberglass bow - Quantum Bass Center provides good-sounding, high quality instruments with professional-level setup, professional strings, PADDED bass bags (instead of just fabric covers), and properly balanced wood or carbon-fiber bows. - Instruments appropriate to your style of playing - CHOOSE from orchestral, jazz, bluegrass, or rockabilly setup! ​- Rent any time, year-round. You don't have to wait until school starts to receive your instrument - or start learning to play it! Take lessons or classes here and get the distinct advantage of high-quality instruction on your instrument BEFORE school orchestra starts! - Friendly and knowledgeable staff to help you select the right size instrument and answer your questions. - ﻿Packages of the accessories and books﻿ required by different schools. - We do not overcharge the value of instruments bought with rental credit! ​- We make every effort to fulfill rental requests without waiting lists: we maintain quantities of rental instruments in stock. - We WILL rent less-common instruments (special sizes, left-handed, 5-string etc) depending on availability. - Want a free month's rental? Ask your orchestra teacher to include Quantum Bass Center on her list of recommended instrument shops, or to have Quantum Bass Center come to your school to do a rental instrument fair! If they agree, we'll give you your next month's rental free, to thank you for spreading the word! - Summer rental incentive program! We strongly support students studying and practicing over the summer, instead of turning in and re-renting their instruments. Show us proof of participation in a summer music festival, sign up for QBC's summer bass workshops, or bring a lesson log from your private teacher, and receive one month's instrument rental free! Need help finding a private teacher or summer music festival at your level? Just ask. - Summer Jump Start for students (and their parents) who will be starting school orchestra in the fall! Beginning a stringed instrument in a classroom setting can be confusing - let us help you get ahead of the curve. These one-time 2-3 hour sessions give you essential information on safely handling and transporting your instrument, holding and tuning it - plus answer your questions. FREE for our rental customers! - Re-kindle your motivation: most often, when learning an instrument seems to be too difficult and a student is losing interest, there are problems with the instrument itself or the student's technique habits that can be addressed to free him up to make music. At Quantum Bass Center, we are first and foremost musicians, who care about developing students. We are ALWAYS there for you - to look over and adjust your instrument, conduct knowledgeable technique evaluations and pedagogically sound lessons, and we encourage you to browse our library, try out different instruments, practice in our practice room, hang around and ask questions, and feel like part of the community of musicians. We are a resource center! - RENTING ELSEWHERE? Ask us about our RENTAL RESCUE program! See THIS PAGE for details. A: We offer BOTH a monthly rental program that allows you to exchange instruments and accumulate store credit toward any instrument you eventually want to buy, AND a new Rent-To-Own program for brand-new instruments, where you will pay off the same instrument you have been renting. Q: Is there a term for the rental? A: No. You may return it at any time, with the only restriction being that we don't prorate less than one month's rental fee. Q: When does my rental get charged? A: Your monthly rental fee will be charged on the same day of the month on which you originally picked up your instrument, unless you request a different date. Q: Can I apply my rental credit to a used or consignment instrument? A: YES! You totally can! Get the bass you want, not the one you've been renting or a limited selection of new Chinese basses at full list price! Our everyday discount prices still apply even when you're using your rental credit toward a purchase. Q: Can I trade in an instrument I bought with my rental credit? A: Yes! Trade-in allowances start at 80% of what you paid, depending on condition. So take good care of the instrument you purchased, and receive the most for your trade-in. Q: What if I have a lot of rental credit, but no longer play the instrument and don't really want one, I just want to get something for the credit? A: If you have accumulated enough rental credit to purchase an instrument, allow us to assist you in DONATING YOUR RENTAL CREDIT to a school!! If I were a school, I would be on this like...I don't know...slice on bread...? Something like that. Find an instrument rental program that allows you to donate your rental credit, and you have found Quantum Bass Center. If the rental credit is not enough for an instrument, we regret that we don't really offer a dollar-for-dollar premium in exchange. In these cases, it's more like renting a car or renting an apartment - the use of the instrument is what the rental fee pays for. Q: Can I exchange the instrument I rented for a different one? A: Yes, depending on availability. Many growing students exchange their instruments for larger sizes. Rent-To-Own instruments are not exchangeable. Q: Do you rent new instruments? A: Yes - there is a price for renting brand-new instruments and we also have a new Rent-To-Own program. Q: How much do you charge to outfit one of your basses with the Laborie-style angled endpin? A: Drilling the rental bass (if it has not already been done) is FREE. FREE, FREE, FREE. We advocate the use of the angled endpin and believe it should be made as accessible as possible. You need only purchase an endpin, as they are individually-sized accessories. Q: Can I rent one of these nice old basses to play a gig, audition, session, etc.? A: We are free to rent instruments owned by Quantum Bass Center, but not instruments we are showing on consignment. Q: My rental instrument is used and/or shows signs of previous repairs. A: That's true. All of our rental instruments are of very good quality and are set up for optimum playability. There is a wide variety of brands. Some of them have had repairs which, although they don't affect the playability, have devalued the instruments to a very low retail value. In some cases, this allows us to rent out much, much finer instruments than are typically made available for rental! There is no obligation to accept or keep a rental instrument if you don't care for it. Q: Can you provide specific strings, bows, pickups, etc.? A: We will gladly outfit your rental instrument to suit you - you must purchase the requested items (pickup, strings, etc) and we will install them on your rental instrument at no cost. We regret that we don't offer high-end bows for rent at this time, though we do sell them at unbeatable prices, and do accept them back on trade or consignment. Those wishing a customized bridge (flatter for fiddle playing, for example) must pay for the additional bridge to be fitted by our repair department, but we are happy to do it.